We meet at the 4-Star Oberoi Maidens Hotel for a two-night stay, in the heart of New Delhi close to diplomatic missions, shops and historical landmarks. Today is devoted to a fascinating sightseeing tour covering the ancient streets, temples and colourful markets of Old Delhi as well as the leafy avenues and colonial architecture of New Delhi. Our tour includes India Gate, Raj Ghat, the Parliament House, Humayan's tomb and Qutub Minar. We also visit Jama Masjib, India's largest mosque, and pass the vast Red Fort, constructed by the Moghuls in the 17th century. We leave Delhi on the Shatabdi Express to Kalka. Here we board the UNESCO-listed narrow-gauge Toy Train to Shimla. From 2017, we travel in specially chartered carriages, which have an exclusive heritage feel, enjoying complimentary snacks and heightened comfort en-route. Alternatively, you may choose to make the journey by road. Today, we explore Shimla by car and see sights such as the Viceregal Lodge, a striking 19th century Elizabethan-style mansion that was the summer seat of the viceroys of India until the 1940's. After lunch, we take a leisurely stroll along the Mall to the town's Gaiety Theater, the Victorian-Gothic Christ Church and Scandal Point - so called because it was where people would traditionally meet to gossip. A car is available if you would prefer not to walk during the afternoon. On Day 6 you are free to explore at leisure. 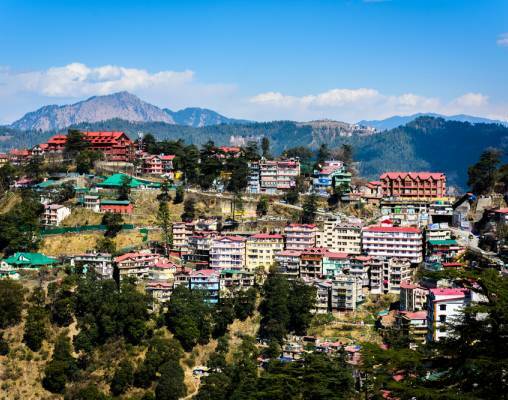 This provides you with a great opportunity to travel further into the Himalayas for majestic views towards the higher, snowcapped mountain peaks of the world's tallest mountain range, followed by a High tea lunch at Wildflower Hall, with walk in gardens. (please note, these experiences are payable locally). We leave Shimla in the morning and travel by road, for the journey back down the mountains through stunning scenery to Chandigarh. Here we join the Shatabdi Express to Delhi, for another night at the Oberoi Maidens Hotel. Today you are free in Delhi until mid-afternoon, when we transfer to our hotel train, the Palace on Wheels, for an enchanting journey through the bygone eras of the Maharajas. We have time to settle into our comfortable cabins before we enjoy dinner together in the restaurant car as the train heads into the night. Our first stop is the capital of Rajasthan. 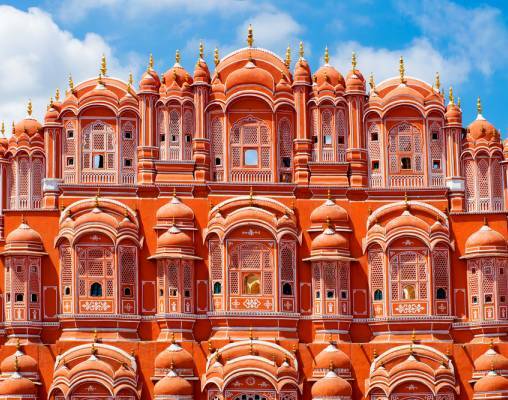 Founded in 1727 by Maharaja Sawai Singh II, this lovely city is often referred to as 'the Pink City' after the buildings were painted pink in the 19th century to celebrate a visit by Queen Victoria's husband, Prince Albert. Sightseeing includes the imposing Palace of the Winds, whose ornate façade once enabled the ladies of the royal court to observe life in the street below whilst remaining in 'purdah.' We also visit the magnificent Amber Fort, one of three hilltop forts that dominate the hills above Jaipur, and enjoy lunch at a local hotel. During the night the train continues east. We leave the train to visit the Ranthambore National Park, to spot tigers, leopards and other native wildlife before we head to Chittorgarh to see the majestic hilltop fort, the Tower of Victory and the intricate Tower of Fame. 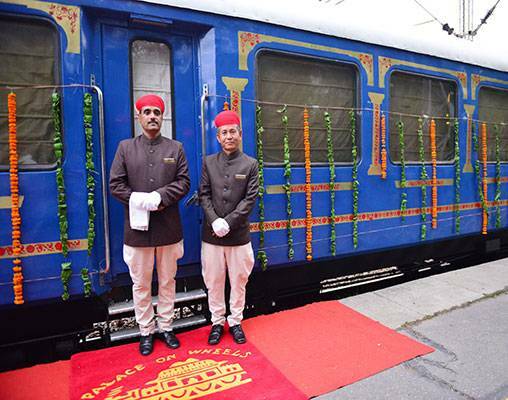 The Palace on Wheels reaches Udaipur this morning. We leave the train for lunch for lunch at a local hotel before taking a cruise on Lake Pichola, sailing around the small island and the Lake Palace Hotel, originally the Palace of the Maharani of Udaipur. On our return to Udaipur we rejoin the train. 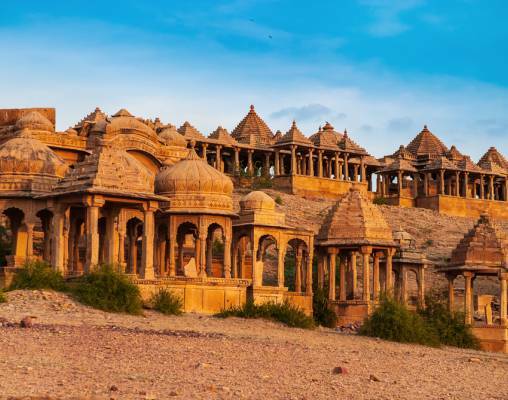 On Day 12 we arrive in Jaisalmer, a fairytale walled town in the Thar Desert. We explore the narrow, twisting streets of the town center, see beautiful merchants' houses with intricately carved sandstone façades and enjoy a camel ride into the surrounding desert. We dine together at a local hotel before the train departs for Jodhpur. 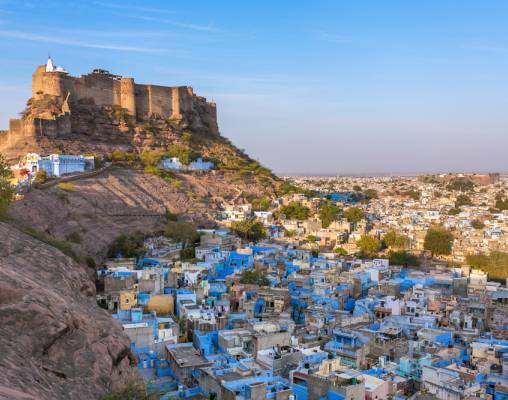 Jodhpur is known as the 'Blue City' due to the hue of the houses within the old walls. During a morning tour we see the impenetrable walls of the Mehrangarh Fort and Palace with fine sandstone carvings. We enjoy lunch in the Palace Hotel and visit Jaswant Thada, a white marble cenotaph. We rejoin the train and journey towards Agra. This morning we arrive into the beautiful city of Agra, where we disembark the Palace on Wheels for the final time. After leaving the train, we visit Agra Fort, the majestic red sandstone citadel and the captivating Taj Mahal, the iconic masterpiece in white marble. 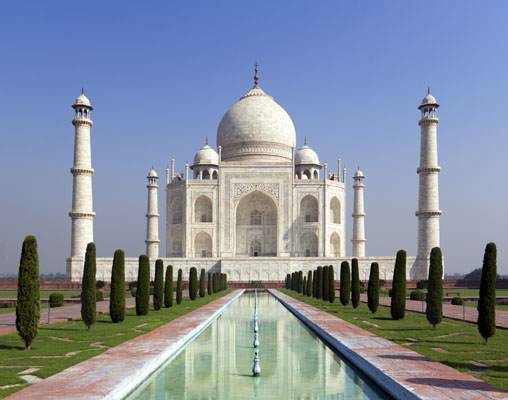 Built by the Mughal Emperor Shah Jahan in 1653, for his favorite wife Mumtaz Mahal, the Taj Mahal is the world's finest example of Mughal and Persian architecture. This afternoon, we take the Gatimaan Express train to the capital city of Delhi, where we check into our hotel, the Taj Mahal Hotel and enjoy a farewell dinner. We bid farewell to India today, as you make your way to the airport for your flight home. Built in the early 1900s, the magnificent Maidens Hotel is one of Delhi's oldest hotels. This elegant 4-Star hotel stands in eight acres of private gardens on the banks of the River Yamuna, just a short distance from Delhi's famous Jama Masjid Mosque and many of the city's other sights and attractions. Full of colonial charm and turn of the century architectural features, the Maidens Hotel has a restaurant serving European and Indian cuisine, the Garden Terrace coffee shop and the intimate Cavalry Bar. There is also an outdoor swimming pool and tennis courts. The comfortable rooms are all air conditioned and come with a telephone, satellite television, minibar, hairdryer and a safe. The wonderful 5-Star Oberoi Cecil Hotel in Shimla is reminiscent of a bygone era, a celebration of colonial elegance and grace. Restored to its original grandeur with wooden floors and period furniture, it boasts fabulous views of the mountains and valleys. A heated swimming pool, billiards rooms and many opportunities for nature walks, make this luxury resort an all season destination. Rooms include satellite television, air conditioning, telephone, minibar, hairdryer and a safe. This delightful service offers some of the best in Indian rail travel. Newly refurbished this year, the new train contains 14 passenger coaches, each named after a famous place in Rajasthan to immerse you further in Indian culture. Each deluxe coach contains three cabins with their own lovely color scheme. The Shatabdi Express trains are some of the fastest in India and are the pride of Indian Railroads. Fully air conditioned and of a far superior standard to most Indian trains, the Shatabdi Express apparently always arrives at the best platform a station has! The average speed on most lines is 68mph (110km/h) although the service between Agra and Delhi can reach speeds of 80mph (130km/h). During our journeys on the Shatabdi Express we travel in air conditioned Chair Class. Complimentary snacks, meals and beverages are generally provided during the journey. The Shivalik Express, affectionately referred to as the 'Toy Train' travels between the Indian town of Kalka and Shimla, capital city of the Indian state of Himachal Pradesh. 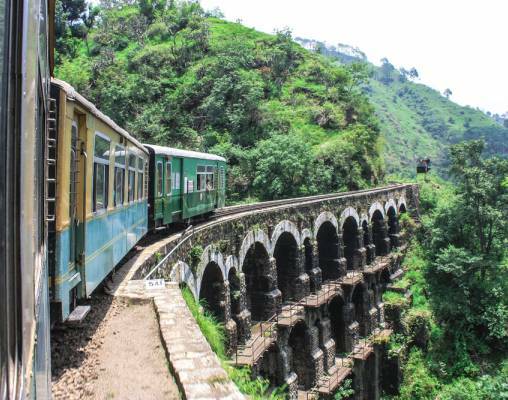 The Toy Train's ninety-six kilometre narrow-gauge track through the Shivalik foothills of the Himalayas is one of three Indian mountain railroads which together constitute a UNESCO World Heritage Site. Built by British colonists, the Kalka-Shimla Railroad opened in 1903. An extraordinary feat of railroad engineering, the line negotiates 102 tunnels, more than 864 bridges and around 919 curves. The Toy Train's passengers have plenty of time in which to admire and marvel these features as well as the spectacular mountain panorama that line the route, tackling the 1 in 33 gradient as the train makes its ascent to Shimla demands a leisurely pace. Enter your details below if you would like to be notified when 2020 dates and prices are available for India’s Palace on Wheels. Prices are correct at the time of publication, however are subject to change at time of booking. Hotel and Rail accommodations listed above, are subject to change based on availability at the time of booking. Prices are land-only, per-person based on double occupancy.